The waterproof-breathable Columbia shell and inner insulated jacket can be worn separately or together thanks to our exclusive Interchange System. 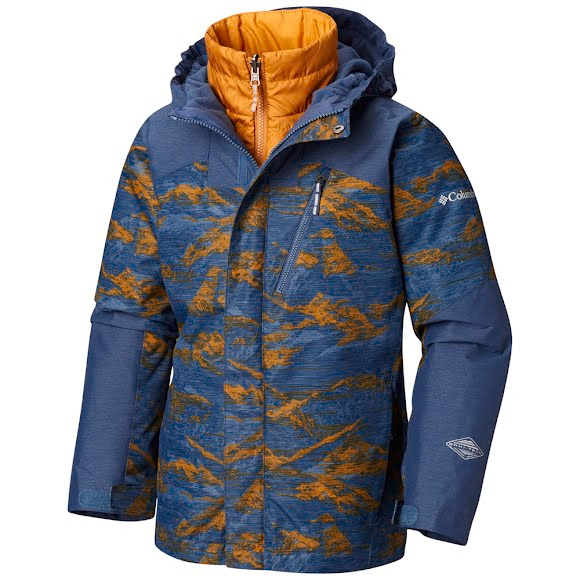 The inner jacket is packed with 80g of synthetic insulation and includes a thermal reflective liner to help regulate body heat. Featuring our exclusive Outgrown™ system to get him through those pesky growth spurts. The OUTGROWN™ Grow System from Columbia allows you to extend the life of your child&apos;s Columbia outerwear so that it lasts through multiple seasons, regardless of growth spurts. Located on the pant legs and jacket sleeves of select Columbia products, is an extra bit of fabric that is held back by a contrasting thread (pictured in blue below). Simply fold the sleeve or pant leg inside out, snip this thread and pull to extend the length of the sleeve or pant leg by 1.5 inches. Garments with the OUTGROWN system are great for younger kids who are constantly growing out of clothing from season to season.